I am sending you, under separate (registered) cover, a package of Sister Vajirā's letters to me, written between the beginning of November 1961 and the end of January 1962. I think you will find them of interest, but for obvious reasons they should be treated as confidential. Without, for the present, commenting on the letters themselves, I shall fill in the background for you. Up to 1961 I do not recall having met Sister Vajirā on more than one occasion, and then for hardly more than a minute. Before then, in 1956, I think, I wrote an article, 'Sketch for a Proof of Rebirth', which was printed in the Buddha Jayanti. 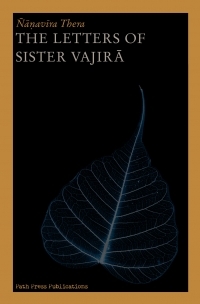 Sister Vajirā read the article and wrote to me saying that she was much impressed by it, and asking whether she could translate it. I gave my consent, but owing (partly) to a misunderstanding I was not satisfied with her translation and it was never published. We exchanged a few slightly acrimonious letters (neither of us being inclined to mince our words), and the matter was closed. After that, she sent me once or twice some articles she had written, asking me to comment on them. Being busy with my own affairs, I discouraged her from this habit and generally froze her off. 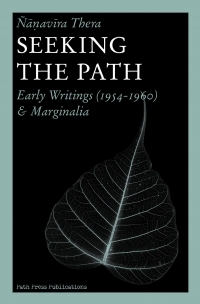 About July 1961 Sister Vajirā wrote to ask whether she could visit me to discuss Dhamma. I agreed, and she came one afternoon for about two hours. Thereafter we had a brief exchange of letters on vegetarianism (which she practised) and also to discuss an English translation of the Dhammapada that she was making. (I have not kept those letters.) Then I sent her my typescript of the NOTE ON PATICCASAMUPPĀDA and PARAMATTHA SACCA, which I had just finished writing. Sister Vajirā replied with a letter dated 12 November 1961, which is the first of the set I am sending you. She came again to the Hermitage on the 18th November and spent the whole day discussing Dhamma. I did not see her again after that. Things were now happening much too fast for me to keep up with them. (It seemed -- and seems -- to me that she went through in about five days what took me three months and a half -- though of course our circumstances were different -- and I was quite unprepared for her subsequent behaviour, though she gave me notice of it at the end of the letter of the 23rd.) Evidently what happened was that with the sudden release of the central tension all her compensating tensions found themselves out of work and began aimlessly expending themselves this way and that, and some time was required before she found a new position of stable equilibrium. I asked the Ven. Thera for a report, and he replied (as I hoped he would) that although she had recovered she 'seemed to be a changed person'. I was not at all pleased when she was bundled out of the country before I was able, as the doctors say, to 'follow up the case'. But later reports seem to confirm that she has remained 'a changed person'. 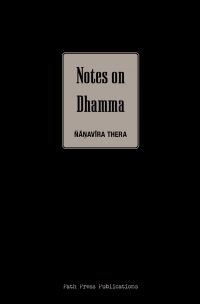 The fact that she now seems to have lost interest in the Dhamma and no longer associates with her former Buddhist friends is a good sign, not a bad one -- when one has got what one wants, one stops making a fuss about it and sits down quietly. (In my own case, I had previously been maintaining a continuous correspondence with the Ven. 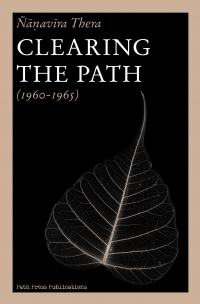 Ñānamoli Thera about the Dhamma, and then afterwards I stopped it entirely, finding it pointless. There was no longer anything for me to discuss with him, since the former relationship of parity between us regarding the Dhamma had suddenly come to an end. I could only have renewed the correspondence if he had been made aware -- which he was not -- of our new relationship.) Anyway, even though I have only Sister Vajirā's letters to go on, I do not see any reason to doubt her statement (23 January 1962) that she has ceased to be a puthujjana. Perhaps I should add that though she seems to have had a fairly strong emotional attitude towards me (as 'representing the arahat'), this has not been mutual. At no time have I found myself emotionally interested in her in any way, though, naturally enough, from the point of view of Dhamma I regard her with a friendly eye.